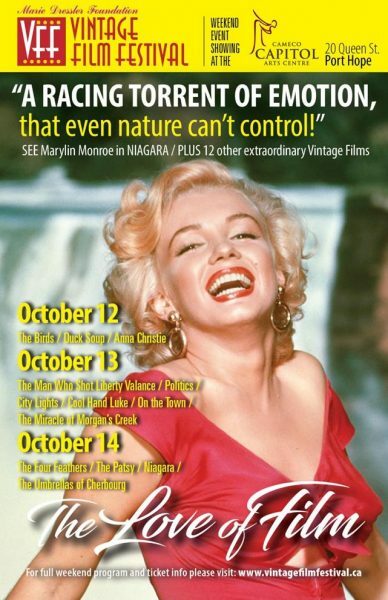 Ontarians, set your diaries now: Niagara will be screened at the Capitol Theatre in Port Hope on October 14, as part of this year’s Vintage Film Festival, sponsored by the Marie Dressler Foundation (the Canadian-born character actress was an idol to Marilyn.) Mark Baker reviews Niagara here. “The story starts relatively quickly and the tension keeps increasing. I was surprised at just how quickly the story unfolded. There are some nice plot twists along the way as well that kept me engaged. Likewise, the acting was wonderful. I’m not that familiar with Marilyn Monroe as an actress (this is only the second film I’ve seen her in), but her performance here was strong. You could see her character’s mind working. The rest of the main cast is just as good, which is one reason why I got so lost in the story so easily. While the movie was filmed partially on sound stages in California, it was also partially filmed on location. That gives the sinister story a gorgeous backdrop. The Technicolor picture adds to the beauty.